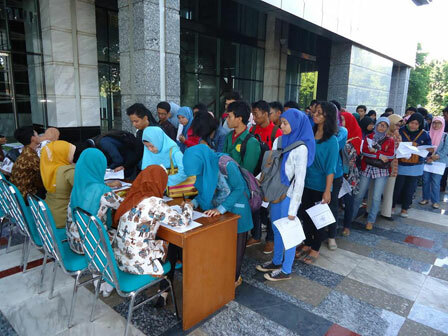 Thousands of high school students came to South Jakarta Mayor office, Thursday (4/24). They came to participate in South Jakarta BAZIS scholarship recipients selection.
" ZIS funds will be returned to the people who deserve it"
Head of South Jakarta BAZIS, Sutriana Lela, said that South Jakarta BAZIS will provide scholarships to 300 high school students and 600 college students this year. The scholarship comes from zakat, infaq, and sodaqoh (ZIS) in 2013 of Rp 23.1 billion. "ZIS funds will be returned to the people who deserve it, " he said. To get the scholarship, the applicants must complete a number of requirements such as family card (KK), ID card, report/GPA, as well as student card. In addition, scholarship recipients are also required to attend interview session. For those participants who pass the selection will receive a scholarship in July. "For high school students will receive a scholarship equivalent of Rp 2.4 million per year. As for college students will receive of Rp 3 million per year," he added. Mutia Rahma Pralista, a second semester student of Universitas Bhayangkara Raya hopes to get this BAZIS scholarship. "May I can pass the selection and win this scholarship to ease my parents burden," she hoped.